Can communicate with windows/ Linux client, different with the windows version server is Linux server have not a built-in FTP server,this is because Linux already have a file transfer server, so if you want to access the Linux server files,you can manually add SCP or FTP client to client's tunnel, then use 127.0.0.2 IP address in FTP client to access server's file system. If you install at pure 64 bit Linux, please check your Linux version have installed 32 bit program runtime library, if not, please install 32 bit program runtime package (such as libc6-i386/ia32-libs for ubuntu amd X64, step is 1.sudo apt-get install libstdc++6 2.sudo apt-get install ia32-libs, Cent OS please use yum install glibc.i686 glibc-devel.i686). Can install as root users (if you want SNT server listen at 80/443 port, you need install as root users) or other users. Such as install as root. Use startsnt.sh to start SNT, if you want to SNT listen at port 80 and 443, you must have root user privileges, otherwise only listen at the port more than 1024. SNT server run as daemon process. Use stopsnt.sh to start SNT. After you purchase a license, you can use snttool to active SNT server. In the prompt window, direct enter the registered user name and registration code (copy and paste it), or saved registration code to a file, such as license.txt (not need registered user name), and in the registration window, enter the file name license.txt. (1) Use snttool to create the basic configure, include HTTPS listen port, http tunnel listen port, admin user password etc. (2) Use startsnt.sh start super network tunnel server. 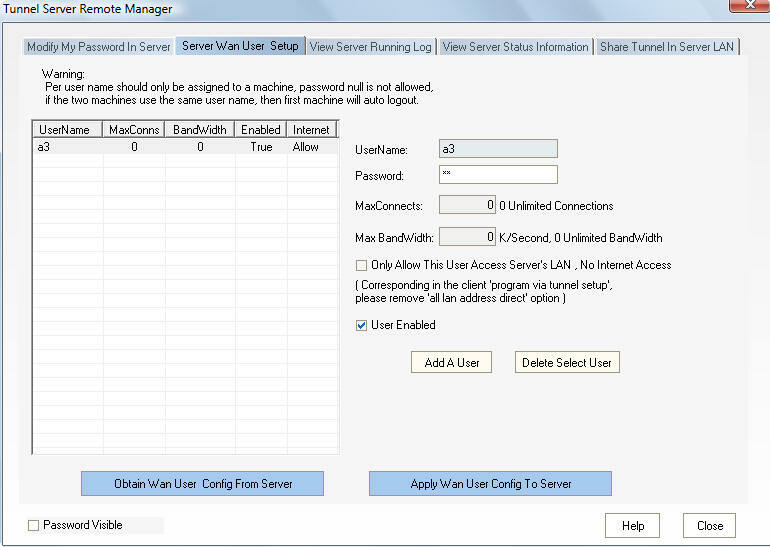 (3) Use windows version client connect to server, click 'Setup'->'Remote Manager Server' menu, remote add server WAN users and server local LAN share users. (4) If you need additional configuration, you can directly modify the tunnelserver.ini file, and then restart the server. #Server WAN users config, use windows version client remote config. #LAN share users config, use windows version client remote config. #server admin user password, use sntttool to configure. #Server bind at local IP addesses, multiple IP use comma separate, empty mean bind at any IP. #Note: Server bind port use so_reuseaddr option, so if you have other server (also use so_reuseaddr option) listen on same port, it can also working in this case. #Such as, you have a router device, first start a http server (listen only at LAN address 80, use so_reuseaddr option) for remote configure. #Next install SNT server at your router device, then start SNT server (listen at any IP address 80) after http server started (Add it at /etc/rc.d/rc.local). #If LAN user access device port 80, use LAN address, it will access router remote configure website, if WAN user access device port 80, use WAN address, and it will access SNT server 80 port. #Another way is to use Apache reverse proxy module. #Only accept these IP address connect to server, support , and *, such as 122.1.5.*,122.1.6. *, empty mean allow all. #then your config the below option,you can see help file for detail. Server can automatically updates your dynamic IP address every time it changes on one dynamic DNS services . # This allows you client connect to the servers running on your own computer using a fully qualified domain name (e.g. myhost.dyndns.org, where myhost is a name of your choice). Since your host name never changes it makes accessing your servers much easier than using your IP address which changes each time you reconnect. This is also useful when you want to remotely control your PC. 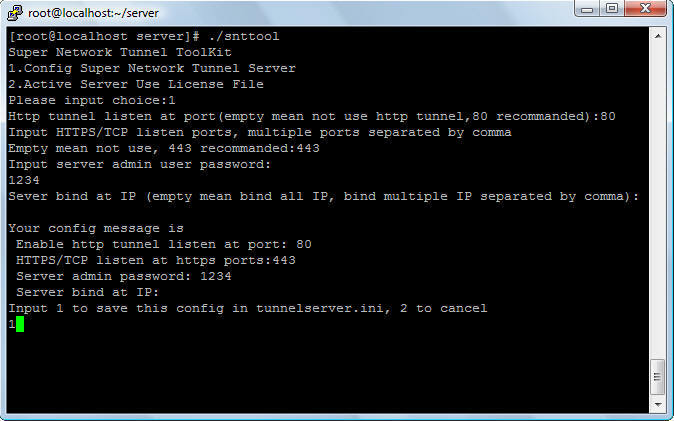 If you do not know how to create tunnelserver.ini file, you can use the windows version of the SNT server UI to config it, when configuration completed, copy tunnelserver.ini to the corresponding directory. 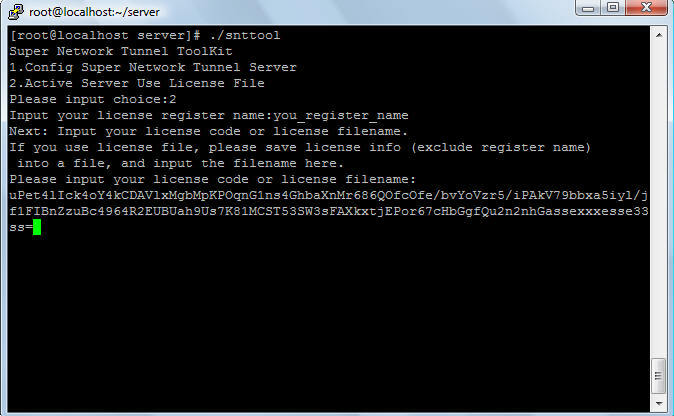 Super Network Tunnel Client Command LINUX SDK is free, but requires you to have a registered version of the SNT server to publish, if you do not have a registered version of the snt server, you can not integrate this into your program. tunnelclientservice_portable.exe portable -clientpwd="new_client_password" -proxypwd="new_proxy_password" -proxyusername="new_proxy_username" -proxydomain="new_proxy_domain"
(1) Use your program config tunnelclient.ini, or can use tunnelclient_runasadmin.exe to create it at first time. (2) Run tunnelclienservice_portable.exe portable -clientpwd="new_client_password" -proxypwd="new_proxy_password" to launch command SDK or use tunnelclienservice_portable.exe portable to launch command. (3) Wait local socks5 port ready (check local socks5 listen port) or capture client command line output, the prompt is "Connect to tunnel server success" or "Connect to tunnel server fail". (4) Make your program use local socks5 proxy (support UDP) or the TCP/UDP port mapping to connect to remote server network via tunnel. (5) When your program quit, terminate tunnelclienservice_portable.exe process. Optional step is use -test param do a connect test. when configuration completed, copy tunnelclient.ini to the corresponding directory (including the linux version of the SDK can be used this way).